The presidential election in Colombia this past Sunday, May 25th, resulted in no official victor. As mandated by national law, a presidential candidate must win a majority vote of 50%.1 Thus, the two front runners, incumbent Manuel Santos and challenger Oscar Ivan Zuluaga, will compete in a June 15th runoff election after winning 25.6% and 29.3% of the vote, respectively. The election recorded historically low voter participation; an estimated 60% of eligible voters did not turn out.2 Also, 6% of submitted ballots were blank, possibly in demonstration of dissatisfaction with all five of the presented candidates.3 As the two business-friendly and economically conservative leaders near run-off election, they must battle for key alliances with recently defeated presidential candidates. Santos is predicted to partner with leftists Gustavo Petro and Clara Lopez while Zuluaga is anticipated to absorb the votes shared by the 3rd place winner, conservative Marta Lucia Ramirez.4 The campaigning by these two competitors has been called the dirtiest in Colombian history, full of accusations of clandestine activities such as spying, hacking private email accounts and accepting drug profits as campaign funds.5 One might wonder why such dirty campaigning would take place between two very politically similar candidates. The answer lies in the main issue of contention in the upcoming runoff election: what should the Colombian government do to end to a half-century long war with the FARC (Fuerzas Armadas Revolucionarias de Colombia/Revolutionary Armed Forces of Colombia)? 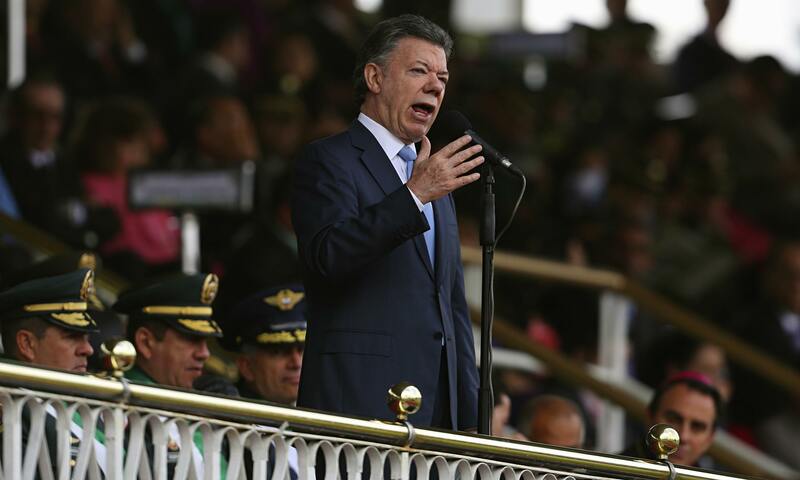 Incumbent Manuel Santos has led a very economically successful term, maintaining Colombia’s status as one of Latin America’s most prosperous economies with predicted GDP growth of 4.7% this year with continually falling urban unemployment since Santos took office in 2010.6 However, the “hallmark” of Santos’ time in office has been the negotiations with leftist terrorist organization FARC. These peace talks began 18 months ago in Havana, taking civil compromise between the Colombian government and the infamous guerilla group farther than ever before.1 Thus far Santos has offered concessions of congressional seats and impunity for past crimes in exchange for the FARC’s termination of all criminal activity.5 The current president is running for reelection with promises to settle these negotiations, which have already taken longer than promised. However, voters are skeptical. With only 500,000 votes between the two last Sunday and alliances solidifying into two very competitive fronts, much is at stake on June 15th.4 Although changing the man in office would not result in huge foreign policy changes, the government’s approach to FARC relations could take a radical 180 degree turn, possibly throwing away 18 months of ground-breaking negotiations. If Santos remains in office, there is no saying if the talks will soon, if ever, end in mutual agreement. If Zuluaga were to win, his strong man tactics could potentially prove to be more productive and forceful than previous paramilitary efforts. In three short weeks, the run-off presidential election will reveal which strategy the Colombian people wish to back: settlement by words or by bullets. candidates with face runoff.” CNN. 25 May 2014. Web. 27 May 2014. Times. 25 May 2014. Web. 27 May 2014. Post. 25 May 2014. Web. 27 May 2014. 2nd Place.” ABC News. 26 May 2014. Web. 27 May 2014. New York Times. 25 May 2014. Web. 27 May 2014. Presidential Runoff.” 25 May 2014. Web. 27 May 2014.